For comic fans, yesterday was a big deal of new releases of their favorite comic books. But there was one release yesterday that wasn't a comic book, but delighted thousands of fans...the SAGA Lying Cat T-Shirt! They were the hit of the San Diego Comic-Con in July and then yesterday, as if the anticipation for the next issue of SAGA (#13, coming next Wednesday!) wasn't already gaining momentum, yesterday's release of the SAGA Lying Cat T-Shirt helped push it over the edge to a frenzy. All day on Wednesday, SAGA fans were showing off their new T-Shirts on Twitter (like this, and this and this) and then last night, over on Tumblr we stumbled on the group of women comic book store employees, Beware The Valkyries. 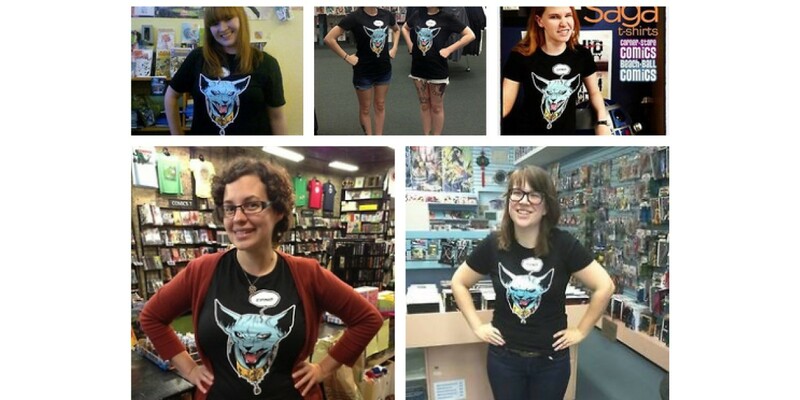 85 women from 70 comic shops across the country coordinated to all wear their SAGA Lying Cat T-Shirts yesterday and, as you can see below, the end result was awesome. If you haven't gotten your SAGA Lying Cat T-Shirt, be sure to contact your local comic book store to get one. Get yours before they sell out! And trust us, they're going to sell out...fast. SAGA #13 hits comic book shops next Wednesday, August 14th. You can tell us you're not excited, but we know you're LYING!